Keep your eyes and face looking years younger with Botox® treatments from Crystal Clear Eye Surgeons. Dr. Avi Meier, Board-Certified in Ocular Plastics, is dedicated to administering Botox® treatments with high expertise and tender care, ensuring desirable results. Botox® injection treatments were approved by the U.S. Food and Drug Administration (FDA) for cosmetic use in April 2002. Botox® has also been approved to treat several other medical conditions since 1989. Cosmetically, Botox® can successfully diminish “crow’s feet” or other wrinkles around the eyes. When injected, Botox® causes temporary paralysis to the selected facial muscles to smooth-out imperfections. Patients may experience minor but temporary discomfort. The entire procedure usually takes approximately 10 to 12 minutes. The physician may numb the area with a cold pack or anesthetic cream prior to injection. The results will be apparent usually within 24 to 28 hours. Results can last as long as 4 to 6 months. Your own results may vary depending on a few factors. Our technicians and doctors can discuss what you can expect and help determine when to schedule your next appointment. Visit BotoxCosmetic.com for more information. Revitalize with Vivité ®, an advanced skin care routine based on an exclusive GLX Technology™ that combines glycolic compound with natural antioxidants. These ingredients form a matrix that deeply penetrates skin to help maximize beautiful results. This combination helps promote the production of hyaluronic acid, collagen, and epidermal growth, all of which are essential to the integrity and health of skin. These products infuse anti-aging ingredients into the skin, even the skin tone, and create a more rejuvenated appearance. Discover the “power to defy” with FDA- approved Juvederm®. This cosmetic procedure is a hyaluronic acid filler used to plump and cushion facial areas that have become sunken or flat. It is effective in rejuvenating common problems such as facial wrinkles and folds, smile lines and vertical lip lines. For eyes, Juvederm® can be used to fill under-eye hollowness and to improve the appearance of dark circles. Juvederm® is known to give natural-looking results that can last up to 4 to 6 months. 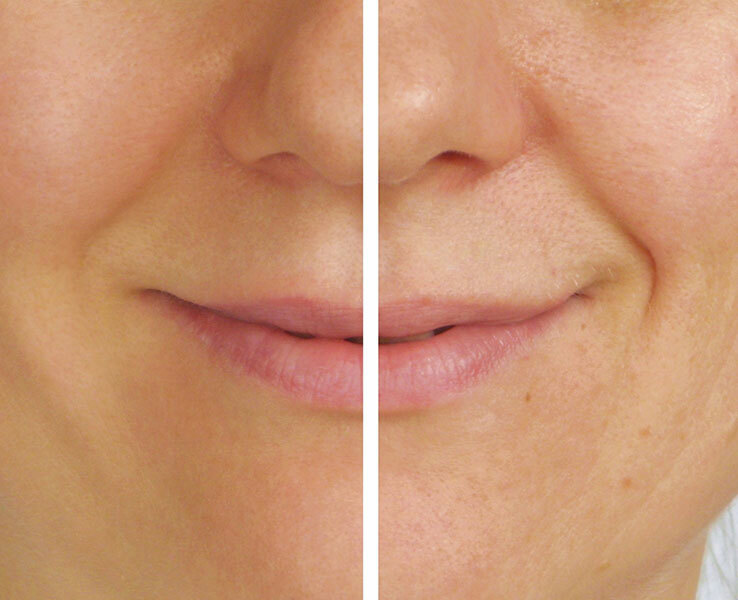 Juvederm® injection gel is well tolerated by most patients. The most common side effects last only for a duration of 7 days. Side effects may include redness, swelling, pain/tenderness, bruising, itching and discoloration of the treated area. Discover the Latisse® difference. Latisse® is a growth treatment for lashes. In fact, it’s the only FDA-approved treatment clinically proven to grow lashes. And it’s the only lash growth product of its kind available by prescription. So you’ll need to talk to your doctor, or contact/visit us here at Crystal Clear Eye Surgeons to see if this treatment is right for you. Latisse® grows lashes longer, fuller and darker. Latisse® solution is a once-a-day treatment you apply topically to the base of your upper eyelashes, as instructed by your doctor. You may start to see more length in as little as 4 weeks and you should achieve full growth in 16 weeks. It’s not an illusion of growth. It’s your own eyelashes — only better. Latisse® makes lash growth possible because of the active ingredient bimatoprost. Although the precise mechanism of action is unknown, Latisse® is believed to affect the growth (anagen) phase of the eyelash hair cycle in two ways: first, it increases the length of this phase, and second, it increases the number of hairs in this growth phase. Latisse® was developed through years of research by Allergan, a pharmaceutical leader with expertise in eye-care products.